For you troglodytes not in the know, Oxford and Cambridge hold an annual boat race and call it "Boat Race." This year was the 158th racing of Boat Race. Unfortunately, Boat Race was interrupted by a smiling man in a wetsuit who dove in the river "Thames at the Surrey bend stage of the race, with around 1 1/2 miles left in the 4 1/4-mile course." Shortly after Boat Race was restarted, Oxford bow man and Boat Race participant, Dr. Alexander Woods, was injured in Boat Race. Oxford's German rower Dr. Hanno Wienhausen lost half of his oar after the crews clashed — allowing Cambridge to cruise to victory against seven oarsmen. A margin of victory wasn't given by officials. 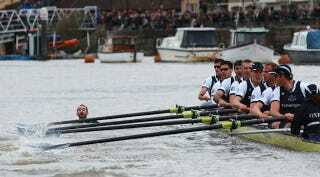 The last time Boat Race was restarted was in 2001 after a similar clash of oars. Cambridge extended its lead in Boat Race standings to 81-76 but the story of the rogue swimmer will carry the day. Cambridge team president David Nelson summed it up best, however: "With all the hoo-hah, the restart, the clash, it was a pretty dramatic [Boat] race."